Carrot Top Pesto is easy to make and super delicious. It’s the best way to use all the pretty spring carrots with the greens on top! Chop the carrots into 2-inch lengths, put them on a baking sheet, and toss them with the oil, salt, and pepper. Roast the carrots for 20 minutes. 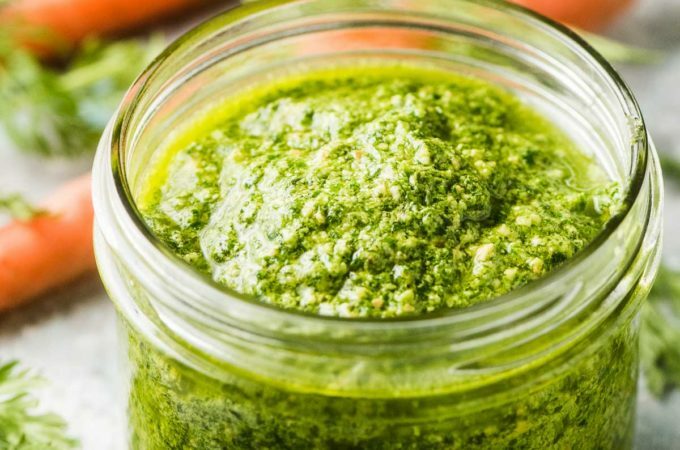 Place the carrot top pesto ingredients in your food processor or small blender and blend until mostly smooth. When the carrots are done cooking, toss them in 1/2 cup of the pesto and serve. You will have more pesto than you need for this recipe. The extra is delicious served with chicken. Or save it to put on eggs, in a sandwich, or tossed with pasta.